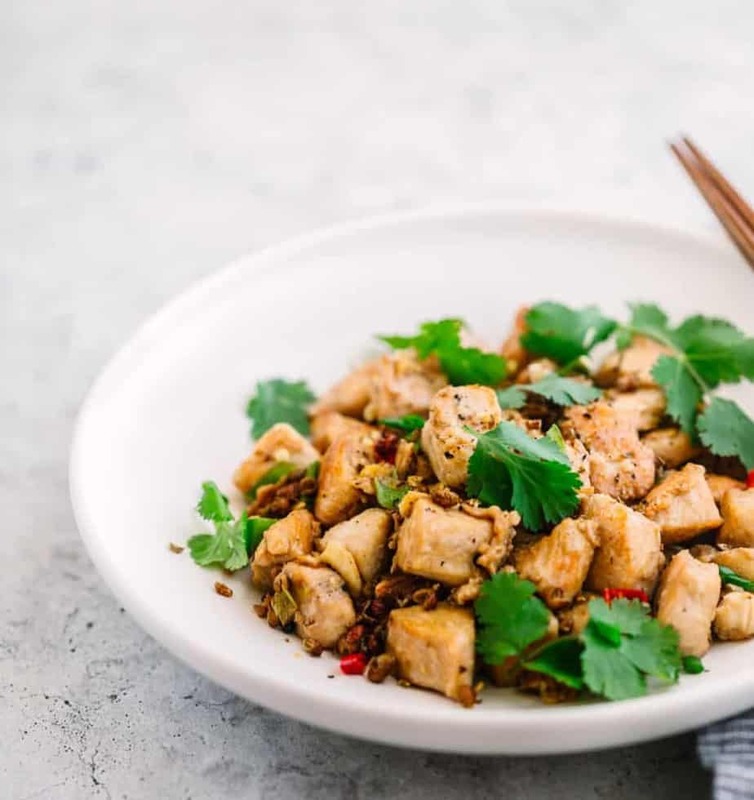 If you are craving Chinese take-out then try this delicious Szechuan peppercorn chicken recipe, made with the numbing, tongue-tingling sezchuan pepepercorn, aromatic garlic and ginger. It has an easy marinade sauce of soy sauce, cooking wine and corn starch. My husband and I are a big fans of authentic Sezchuan food. We have two regular dishes of spicy boiled fish and spicy lamb cumin stir fry that we often grab on our monthly tradition of going to the drive-in movie. The Sezchuan (Sichuan) restaurants are quite far away from our house, so I decided to stock up on some spices like Sezchuan peppercorn to try out some recipes at home. Sichuan peppercorn which in China is known as “ma” has unique aroma and flavour. It creates a tingly numbness in the mouth that stays with you for a few seconds. In cooking, it’s suggested to lightly toast the tiny seed pods, then crushing them before adding them to the food. You can purchase this pepper at any Asian market and at a very affordable price. 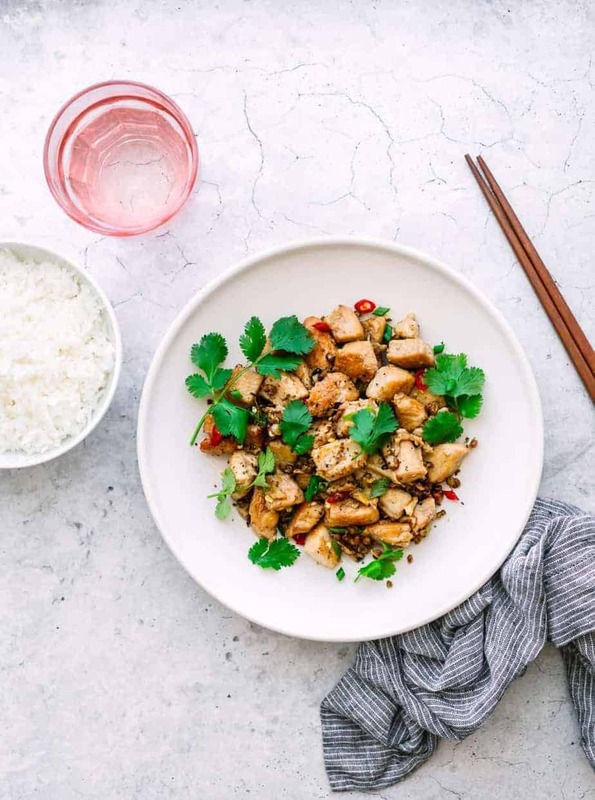 The cooking proccess of this Szechuan peppercorn chicken is simple! I just marinated the chicken with a handful of ingredients: corn starch, cooking wine, salt and pepper (black pepper or white pepper), and only for about 15 minutes. Shaoxing wine is recommended, but if you don’t have it in your pantry simply use dry white wine or sherry. Chicken thighs or breasts may be used in this recipe. I opted in for chicken breasts because they were on sale at my local market. Many cities in the US have one or two Chinese restaurants around town with food that we in America have long-associated with traditional Chinese food. I absolutely love some of those dishes (egg foo young is a long-standing favorite of mine). There is so much more to Chinese food though, and I think the food from the Sichuan region is something that everyone should try. If you like spicy food you’ll likely find the Sezchuan food to be heavenly as a large percentage of the options have a medium to high spice level. If you don’t like spicy food just be sure to let your server know that when ordering at a restaurant, or if making Sezchuan recipes at home you may need to adjust the spice levels accordingly. Properly marinating before you stir-fry meat or another protein is another way to improve both the flavor and texture. It can help tenderize meat and retains the moisture. Be sure that the meat is dry before slicing or marinating. In a small mixing bowl: stir in low sodium soy sauce, white wine, sesame oil. Set aside. Cut the chicken breasts into small bite pieces. In the mixing bowl, marinate the chicken with the marinating sauce. Set aside and let it marinade for at least 15 minutes. Add the cornstarch and mix until the chicken is fully coated. In a skillet, heat up 3 tablespoon cooking oil and cook the chicken until golden brown. Set aside. In a large skillet, heat up 2 tablespoon cooking oil and stir in ginger, garlic, green onion, sizchuan peppercorns for about 1 minute. Add the chicken and the stir fry sauce into the skillet. Keep stirring for about 2-3 minutes. Season with salt and pepper if needed. 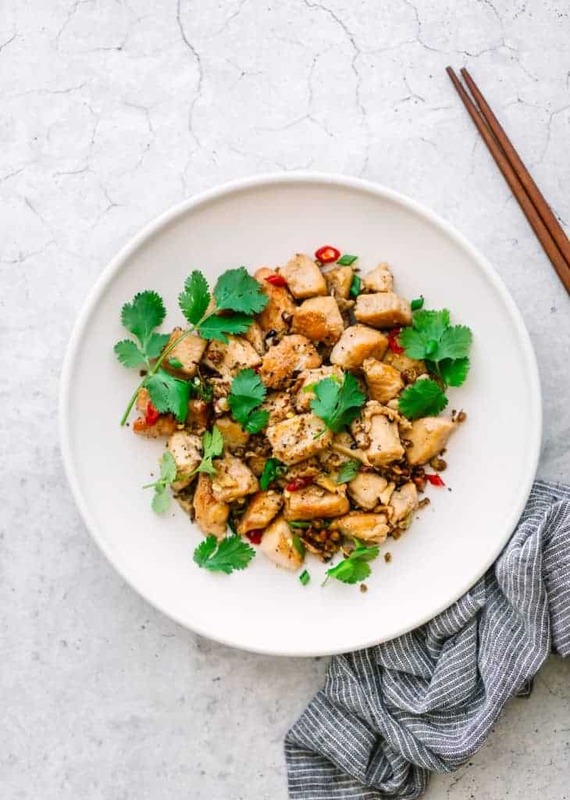 Oh my goodness now this sounds like a delicious sounding way to cook chicken, hands up I do love a good chicken meal and it is always nice to have new ideas! That looks good. Chicken is such a versatile meat. I love finding different ways to eat it so we don’t get bored. This looks like something you could get in a restaurant, only prettier. I know some people who would love it! We do Chinese take-out food once in a while on lazy nights when I don’t feel like cooking. We love Szechuan Peppercorn Chicken! I need to try your yummy recipe! Wow. This looks so good! I love some Chinese food and this will be a perfect recipe to try. Yum! This looks delicious! I like that the recipe is pretty easy and would add a little variety to my meal plan. Thanks! I use peppercorns in a lot of my favorite recipes like chicken and dumplings. That’s why I think this recipe would be really tasty. It’s one I believe even the grandkids would like. They are picky eaters.